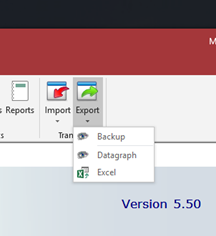 MS Office has some macro security features which you may want to switch off. On our installation media you find two programs named 'AddPath2010' and 'AddPath2013'. Run one of these from within the folder where your Datagraph files are placed to add this folder to your 'trusted locations' on your PC. 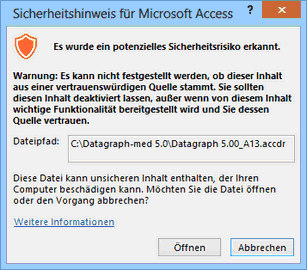 This should stop unnecessary security messages during startup of Datagraph-med. If this message appears during Startup the folder in which Datagraph-med was installed is not considered 'safe enviorment'.